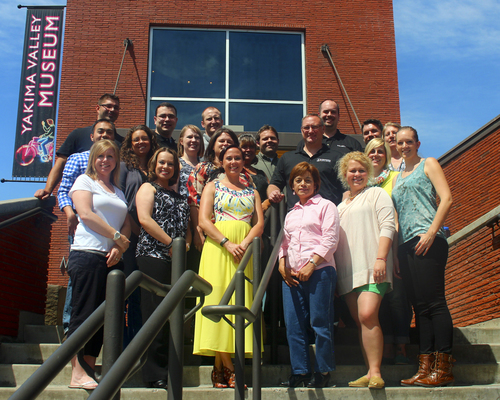 Yakima, Washington (June 18, 2014) - The Greater Yakima Chamber of Commerce is pleased to announce our 28th graduating class of Leadership Yakima. Leadership Yakima is a program designed to develop future leaders for our community. Participants learn about our valley’s history, learn many rea-sons to be proud of our valley, build relationships with their classmates, and learn how our community gets things done. The program was designed to teach our current and emerging leaders the skills necessary to serve our diverse community and provides an opportunity to discover many different organizations and agencies that need volunteers and board members. Justin Bellamy - Huibregtse, Louman Associates, Inc.
Adam Coe - Yakima Federal Savings and Loan Assoc. Amanda Cutter - Avail Home Health, Inc.
Carly Faul - Central Washington Home Builders Assoc. Christie Herbst - Yakima Waste Systems, Inc.
Eva Lounsbury - Tree Top, Inc.
Stephanie Ray - Huibregtse, Louman Associates, Inc.